I'm so glad that summer is almost "officially" here, along with all of the fun summer get-togethers and backyard barbecues. Every year we host 4-6 backyard pool parties (for adults) and we like to serve a variety of appetizers, burgers, hot dogs, steaks and of course, refreshing cocktails to go right along with all of the delicious food. Today's guest-post recipe is courtesy of Sparkling ICE. I think it's perfect for all of your summer parties!!! In a cocktail shaker, muddle apple and peach. Add lemon juice and rum, then shake. Strain mixture over an ice filled glass. 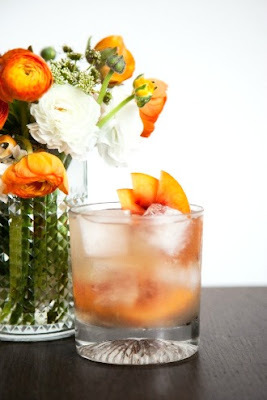 Top with Sparkling Ice Peach Nectarine. Garnish with a peach slice then serve the beverages immediately.